The Mysterians (1957) – SKREEONK! Mysterious Aliens Release a Doom Machine upon humanity – The Mighty MOGERA! Can it’s Apocalyptic Arsenal of Alien Weaponry be Stopped!? Astrophysicist Ryoichi Shirashi (Akihiko Hirata), Jyoji Atsumi (Kenji Sahara), and their girlfriends Etsuko (Yumi Shirakawa) and Hiroko (Momoko Kochi) are visiting a festival in a small village, when a large fire erupts in the forest. Shirashi runs toward it, disappearing. Later, a village near Mt. Fuji is engulfed by an earthquake. Atsumi and the authorities investigate, and they then witness the emergence of a giant robot Moguera from the side of a mountain. Reinforcements soon arrive, but make no progress against the war machine’s impenetrable armor. Finally, the monster is lured to the edge of a bridge rigged to explode. The switch is thrown, and the machine tumbles to its demise down below. Upon further inspection, Atsumi discovers that the robot is made with metals currently unknown to man. Afterwards, Dr. Adachi and a coworker witness activity on the far side of the moon. Suddenly, a large dome unearths itself from the ground at Mt. 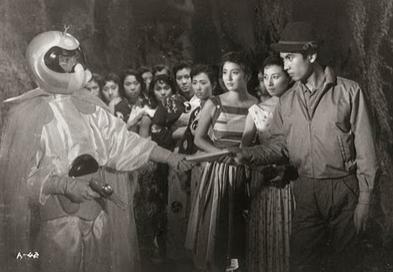 Fuji, and the Mysterians make themselves known. 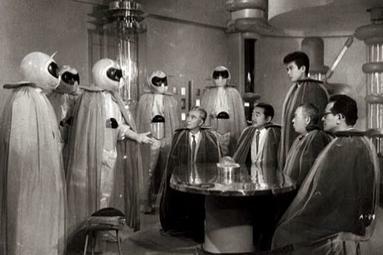 They ask to speak to a few scientists; Adachi and Atsumi included, and are welcomed into the Mysterians’ base. There, the Mysterians propose that attacking them is useless due to their much advanced technology; the only thing they wish is to peacefully occupy a piece of land two miles in diameter, and to have the right to marry Earth women. They inform the scientists that they have already taken several, and proceed to show pictures of their next choices, which happen to be Hiroko and Etsuko, Atsumi’s love interest. Shirashi suddenly appears on television to Atsumi, Etsuko and Hiroko, now clad in Mysterian clothing. He explains that his interest in their science led him to join the Mysterians. He then pleads Atsumi to stop the impending military attack, as the Mysterians’ technology is too much for the Earth’s defenses. The military attacks and suffers several losses. Finally, Japan sends messages to other nations of the world pleading for help. The other nations oblige, and together they develop two flying battleships, Alpha one and two, to attack the Mysterian base. After this attack fails, they develop a new weapon; a highly reflective dish that can stand up to the Mysterian dome’s rays, called the Markalite cannon. Also, the dish is able to shoot a powerful ray of its own. Before the attack begins, Atsumi finds a secret opening to the Mysterian’s base and sets out to find and rescue the women. After sabotaging some of the equipment, he is caught. His captor leads him to the women, already freed, and reveals himself to be Shirashi. Shirashi then tells Atsumi and the others to leave, as the base will soon explode. The attack begins, and the combination of the Markalite’s heat rays along with the newly installed heat rays on the hull of the Beta, the new airship, the Mysterians are finally defeated and driven back to outer space. While not one of the better science-fiction films in Toho’s roster, this 1957 classic is certainly worthy of a second, and maybe a third, look. It kicks off the “alien invasion” trend that would be a common theme in Toho’s science-fiction department for several years. Also, the film introduced another classic monster to Toho’s list: The war machine, Moguera. 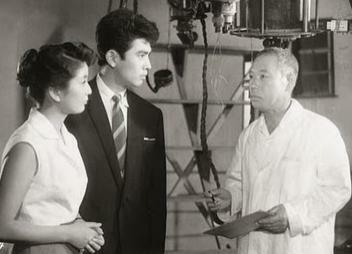 In classic Ishiro Honda style, the film carries with it a message. Often, in the movies of his this reviewer has experienced, it has been the horrors of nuclear war. That message is present in this film, but is also overshadowed by the main message: world unity. As all the terrible things start to happen, Japan calls on the rest of the world, and everybody comes together to unite against their common enemy. The character development in this film is not the best. Akihiko Hirata as Ryochi Shirashi is probably the most interesting; with his story of joining the Mysterians to study their sciences and eventually turning on them as their true intentions surface is quite enjoyable, kind of like a doomed hero. Kenji Sahara plays his role as Atsumi pretty much by the books. It seemed, like in his role in Rodan, and again the following year in The H-Man, that he was still trying to find his specific style. He does play his part well, but not with much emotion that didn’t look forced. Takashi Shimura, as Adashi, is one of the better characters in the film despite being somewhat of a secondary character, but Shimura excels in just about every role he plays in, regardless of whether he is a main character or not. The two most uninteresting characters, sadly, are beauties Momoko Kochi as Hiroko, and Yumi Shirakawa as Etsuko. The audience basically knows only that they are Shirashi and Atsumi’s love interests; other than that, they aren’t given anything to work with (besides being beautiful, which they both pull off well). 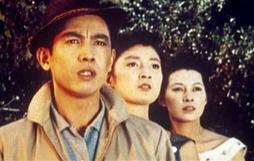 For fans of this type of film, the Mysterians are nothing very special; they are an alien race trying to occupy Earth. They are a good villain, however. Their arrogance in believing their superiority over the human race makes the viewer root against them. They state that as soon as they were discovered, they were attacked; yet almost every time after that, they attacked first, all the while spouting off “We are peaceful and don’t want to make war. Stop the useless resistance.” Yeah, in their culture, apparently a real good way to tell everybody you’re peaceful is to shoot at them. The special effects here are mixed; the explosions and fires and the destruction of miniatures by Moguera was on par with what had been done in these films to this point. However, effects such as Moguera’s eye lasers, the lasers from the dome, and the lasers from the Mysterians’ hand lasers and UFOs, along with the Markalite cannon and the Alpha were all very cartoonish; apparently, they were all drawn by hand. But one can’t be overly critical, partially because of the time period this film was made. Heavy special effects were a new area, and the technology we would see in later films had not been experimented with or perfected yet. So no praise of Eiji Tsubaraya’s work should be spared here. The monster, which is really considered a mech here, Moguera, was not a particularly impressive creation, but not undeserving of a little awe. The monster appears decked out in shiny, ancient samurai-type armor, with large round eyes that blinked white and a pair of spinning antenna atop his head. On the mech’s back was a saw-blade-type fin that, as seen later in the film, spun as it was digging to assist in forward motion. The machine’s arms were odd; they were long and pointy, and spun around, also a tool for burrowing below the Earth’s surface. The negatives to this monster was the suit itself; it appeared to have a “skirt”, and when the monster walked, the skirt wobbled around; which, when coupled with the disproportionately smaller actual legs, looked out of place. Still not a bad first appearance for the mech. One thing worth noting is, that despite the somewhat powerful presence the robot carried with it, its demise was rather comical. The first Moguera, after being fired upon by cannons and machine guns and the like, came to the edge of a rigged bridge. The bridge was detonated, plunging the robot down a rather short drop to the bottom, killing it instantly. The second appearance was even funnier; during the climax as the Mysterians are finally being defeated, they send out another Moguera. Drilling toward the deadly Markalite cannons to disable them, the second Moguera surfaces, toppling a cannon only to have it smash down on top of its head, again instantly killing it. Last but certainly not least, the music in the film is a hit. Akira Ifukube’s masterful scores fit the tone of every scene in the film; the military marches, the battle music, and the eerie end theme are all very moving. Not one of the best, but certainly an important entry in Toho’s lineup, as it would set the pace for many more alien-invasion-type films from Toho. 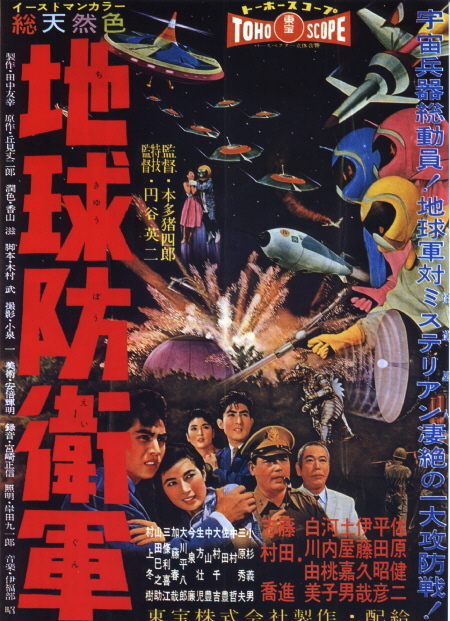 Films like Battle in Outer Space (1959) would use the alien invasion/world togetherness theme again, while one cannot forget the countless Godzilla films that used alien invasion as a plot. All of them seemed to stem from this film, and the idea was refined over the years; not to say it was entirely un-enjoyable here, but this is basically where it started. Another science-fiction film worthy of the name Toho. Posted on October 20, 2011 0 By Jon D. B.	Kaiju Movie Reviews! Posted in Kaiju Movie Reviews!, Toho Movie Reviews! Previous Post Mecha Gorilla Beast Army! Halloween Terrors! It’s a Collector’s Update!